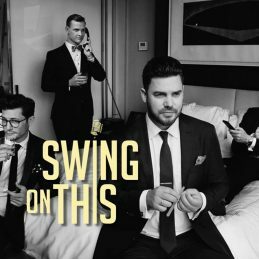 Swing on This – Created for the 2014 Adelaide cabaret Festival, SWING ON THIS brought together some of Australia’s leading stage and screen talents for a one-night-only special event. So well-received was the show that the boys are in demand to repeat the performance again and again with other headliners “dropping in”. Stars, Michael Falzon (We Will Rock You, Rock of Ages), Luke Kennedy (The Voice, The Ten Tenors), Matt Lee (So You Think You Can Dance, Mary Poppins), Rob Mills (Grease, Legally Blonde) and Ben Mingay (Wonderland, Pack to the Rafters) deliver a modern audacious take on all-time swing classics along with well-swung interpretations of rock and pop songs that have defined the last four decades. The friends have fun with the music (and each other) with a flair and ease of artists at the top of their game. Fresh from a sell out run at the Sydney Opera House they are now available for your next event.